USS Spiegel Grove -Top Dog! 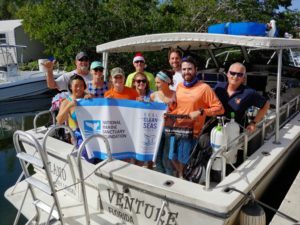 Wildlife on our trips – Critters, Fish and some big stuff! 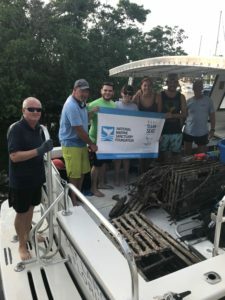 There is a significant amount of trash floating around in the ocean and we all need to do what we can to remove it from or reefs. 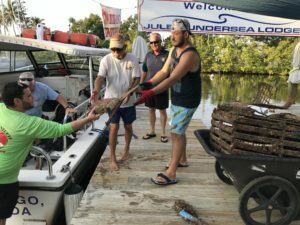 In association with Florida Keys National Marine Sanctuary(FKNMS) we are conducting weekly Debris cleanups in Key Largo. These will occur every Sunday afternoon starting October 28 and ending March 2019. 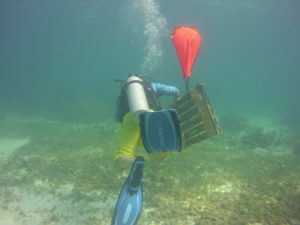 Our permit from FKNMS to remove items from the sea floor from Grecian reef to Turtle rocks. 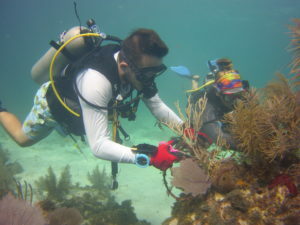 Our crews will take a boat to the northern reefs from Elbow reef to Turtle rocks to locate and remove debris. 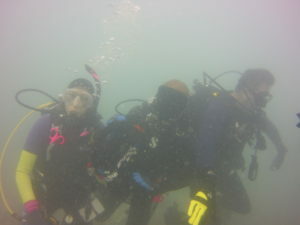 The trips will leave our dock at 1pm and will be FREE to local divers. 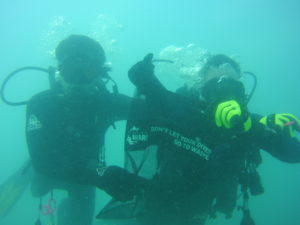 Volunteer divers should have a minimum of Open Water certification and have excellent buoyancy skills. 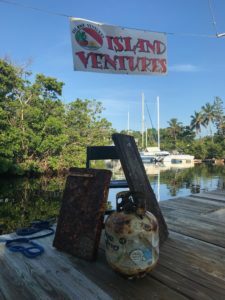 You should also be prepared to get involved with the collection and cataloging process that will happen once we return to the dock. 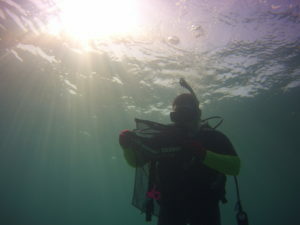 As this is a specialized trip all divers will need to be given an orientation presentation in order that we can collect the debris so these trips have an early checkin time of 11.30am. If you have not taken part in the orientation you will unfortunately not be able to take part in the trip. 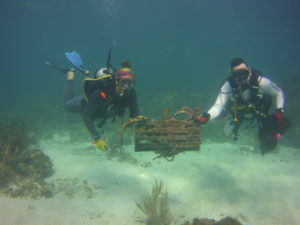 We will be collecting a range of debris from displaced lobster traps, lines, plastic. 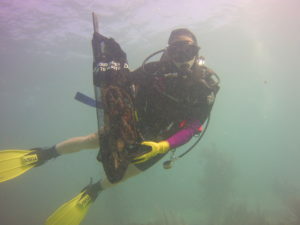 Because of the nature of this work and the possibility that more damage than good could happen divers will be instructed on the methods that we need to use to collect the different types of debris. What do I need to do to get on one of these FREE trips? 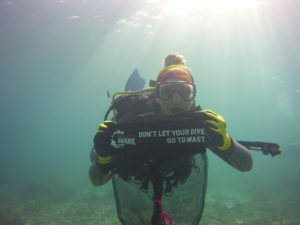 Volunteer divers will need to read these documents prior to arrival at our shop. 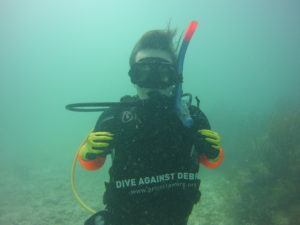 All divers will need to have dive insurance and bring it with them on each dive. 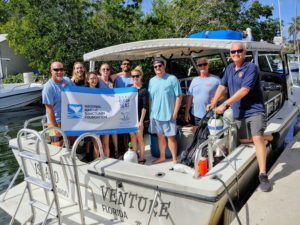 If you would like to take part in this unique opportunity to give back to nature please Book Online or call us on 305 451 4957. Our volunteers were Rebecca, Mariano, Ellery ,Elizabeth, Ken and Caitlin. Our survey site for this trip was Grecian rocks. We were moored at ball number 1 commonly know as Banana. 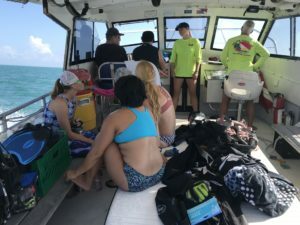 Two dives were conducting from the mooring line round to Barracuda alley and from the mooring line shoreward to the old James Bond film set tower. 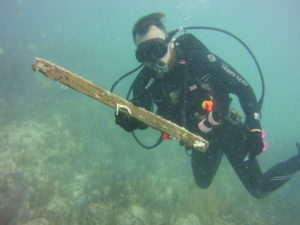 Debris collected was mainly trap debris including timber slats and line. We also recorded some wire fishing leaders. A total of 13 pounds was collected. Our survey site for this trip was North Dry Rocks on the south side. 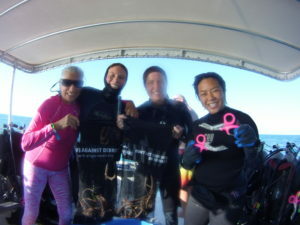 A big thanks going out to Kristen, John, Caitlin and Julian for their help in clearing debris from this other wise beautiful part of the reef. 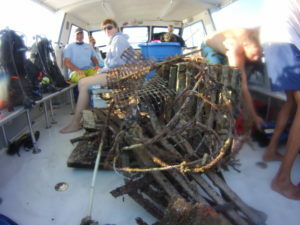 We collected a number of broken traps, parts of traps a lot of abandoned line and a large pipe full or cable. Overall we collected around 350 lbs of debris that will be disposed of at the Monroe County Solid Waste Management center. 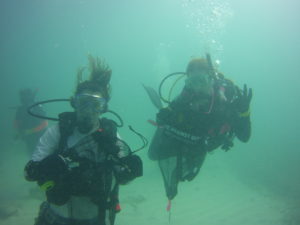 The Volunteers for this trip were Ellen, Tiffany, Whitney, Sara ,Kamil and Lavent. The crew were Wolfman, Emma and George. 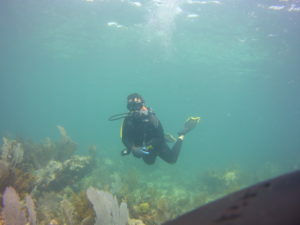 The weather conditions we experienced were quite poor for the Florida Keys with visibility around 10 feet.. 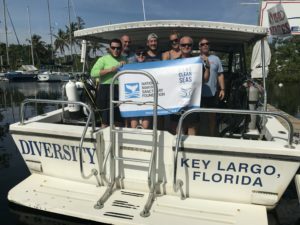 However we achieved our goal and completed the final survey of the south side of Key Largo Dry Rocks. We had a super fun afternoon. 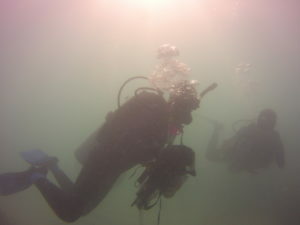 The weather was perfect with flat calm seas and 50 feet of visibility. 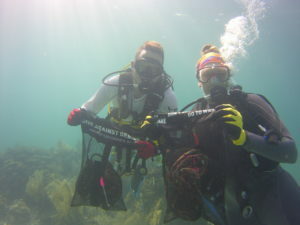 We completed debris surveys at Grecian reef and Dry rocks with this great team of volunteers! 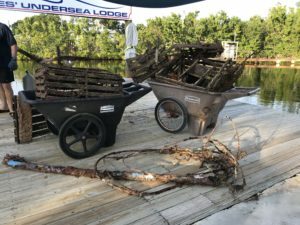 We removed around 70 pounds of debris from the reef. 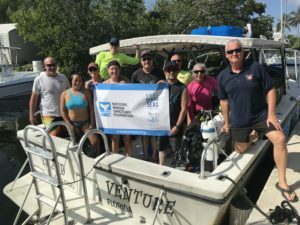 Big thanks to National Marine Sanctuary for part funding these clean ups and to Jane, Ben, Sara, Tiffany, Josh, Analisa and Catherine who without this would not be possible! Thanks to Analisa, Kristin, Robert, Sandy, Clark, Marissa, Kaitlyn, Ann, Brqulio and Adrian for helping us clear Debris from North Dry Rocks. 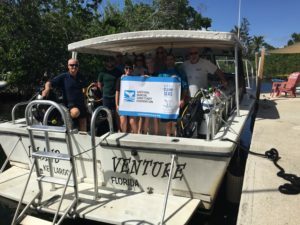 We have had to cancel some previously scheduled trips due to poor weather so we still have some funding available from the National Marine Sanctuary. 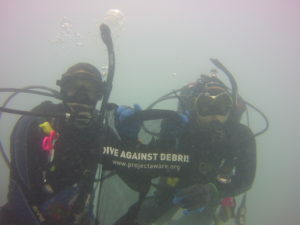 If you can arrange for 6 volunteer divers to come on a debris clearance trip together we will run the trip just for you. We should be able to fit in with you on a date you want. 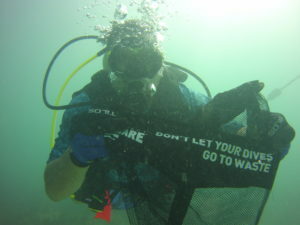 Give us a call on 305 451 4957 to arrange your very own debris clean up trip!